During the past decade, our understanding of the cellular and molecular changes that occur after traumatic brain injury (TBI) has significantly increased, and the notion that endogenous neuroprotective cascades are also set in motion has been explored. One may speculate that the balance between the harmful and protective processes determines the final outcome of TBI, and that the vulnerability of the injured brain to a given insult depends upon its ability to recruit its own endogenous neuroprotective mechanisms. These may be activated as either a direct response to harmful signals, such as increased intracellular calcium levels, or from a pre-injury exposure to a precondition that provides enhanced intrinsic defensive ability. Cascades that are involved in the regulation of cell fate, repair, plasticity, memory, and motor skills, activated by the protein kinases such as mitogen-activated protein kinase (MAPK), Akt, and GSK have a special impact on the balance between injury and repair that determines the final outcome of the cell, tissue, and organism after TBI. Numerous studies have demonstrated the profound effect of preconditioning by brief ischemic or thermal exposures on the outcome of brain ischemic injury. 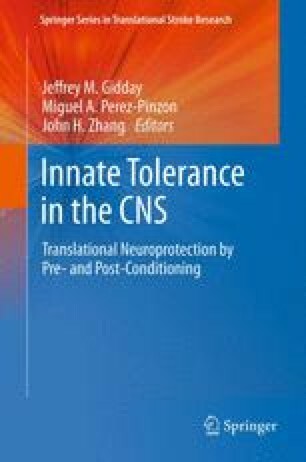 The present chapter focuses on two representative neuroprotective mechanisms: (1) The expression and function of the endocannabinoids (eCBs) and their respective receptors in the brain, on neurons, astrocytes, microglia, and the cerebrovasculature point to their role in multiple functions. The formation and accumulation of eCB in response to injury, along with their multipotent properties as antioxidants, vasodilators, anti-inflammatory agents, inhibitors of excitotoxicity, as well as their role in neurogenesis, suggest that their “on-demand” formation may represent an intrinsic neuroprotective and neuroregenerative response. Interestingly, these lipid mediators, via their specific receptors and coupling mechanisms, activate intracellular signaling cascades that are associated with promoting cell survival. (2) Long-term heat acclimation is a global long-term preconditioning paradigm that induces “cross-tolerance” against a variety of stressors, including TBI, where it conveys improved functional outcome. This is achieved by reprogramming of gene expression. Collectively, heat acclimation causes a two-tier response. Increase cytoprotective reserves suggesting that the cell is now endowed with “on-call” cytoprotective molecules without the need for de novo synthesis and abrupt component, namely, faster transcription during insult to improve renewal rate of stress-protein reserves. A discussion on the role of HIF-1α and of the antiapoptotic, antioxidant, and anti-inflammatory capacity is particularly emphasized.